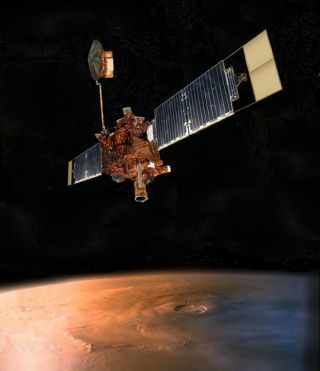 WASHINGTON-- NASA is forming an internalinvestigative board to look into why the Mars Global Surveyorspacecraft stoppedresponding to commands in November, the agency announced Jan. 10. The announcementcomes a day after one of the U.S. space agency's senior Mars program officials told a publicgathering of scientists here that faulty software uploaded to the spacecraftlast summer may have doomed the spacecraft. As firstreported by the Web site NASA Watch and confirmed by sources whoattended the Mars Exploration Program Analysis Group meeting here Jan. 9, JohnMcNamee, NASA deputy program manager for Mars Exploration at the Jet PropulsionLaboratory, said it appears that improperly-coded software caused the MarsGlobal Surveyor to point its heat-shedding radiator toward the Sun, causing the battery to overheat tothe point of failure. "We thinkthat the failure was due to a software load we sent up in June of last year," NASAWatch quoted McNamee as saying. "This software tried to synch up two flightprocessors. Two addresses were incorrect -- two memory addresses wereoverwritten. As the geometry evolved, we drove the [solar] arrays against ahard stop and the spacecraft went into safe mode. The radiator for the batterypointed at the Sun, the temperature went up, and battery failed. But thisshould be treated as preliminary." DougMcCuistion, director of NASA's Mars Exploration Program, said in a Jan. 10phone interview that the software problem McNamee discussed at the meeting isone of several scenarios the board would investigate. Other possibleexplanations include a problem with the spacecraft's solar array, which jammedin November. "Allkinds of things can happen to a 10-year-oldspacecraft," McCuistion said. McCuistion addedthat he expects the investigative board to deliver its report in couple ofmonths, but noted that the actual cause of the failure may never be known. SpaceNews staff writerBrian Berger contributed to this story.